Eleon Grand Resort Spa Free Child Places Low Deposit Family Holidays @ Web2travel Deals. Finding the Best Value Holidays to Tragaki, Zante from UK airports. 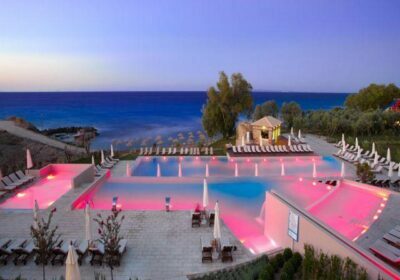 The 4 Star plus Eleon Grand Resort Spa Tragaki, Zante is also called Atlantica Eleon Grand Resort & Spa by some Tour Operators. Eleon Grand Resort and Spa is situated on the seafront; surrounded by olive trees it has a tranquil location ideal for a relaxed holiday. Suitable for all the hotel offers a spa area, pool with waterslides, childrens playground and kids club. The complex is on the beach front close to the village in Tragaki and around 5km from Tsilivi where you can find a variety of shops bars and taverns. Zante Airport is approx 8km away. A total of 174 guest rooms are spread across three buildings, including superior rooms, deluxe rooms, junior suites, family suites, superior family suites (with private pool) and executive suites. All guest rooms are provided with ensuite bathroom with amenities, hairdryer, bathrobes and beach towels, air-conditioning and heating, direct dial telephone, balcony or terrace, mini-fridge, free safe deposit box and an HD 32″ LCD TV with satellite TV, movies on demand, internet access and games. Family and superior family suites feature an additional well equipped kitchenette with fridge, oven and cooking rings, sofa bed, dining table and chairs. Executive suites also have a separate bedroom and two sofa beds in the living area. Facilities include 2 outdoor swimming pools, outdoor jacuzzi, childrens pool, aqualand pool with 4 slides, sun-terrace with loungers and umbrellas, as well as a multi-purpose court and a dive centre. The hotel wellness and spa area features an indoor pool, fitness centre, hammam and sauna, as well as a variety of massages and body treatments. There is also a childrens playground, a mini-club (ages 4-12yrs), a daily soft animation programme and evening entertainment. Wining and dining options include the main buffet restaurant with indoor and outdoor seating, a cocktail bar, pool bar and an entertainment bar. Check Availability and Prices for Eleon Grand Resort and Spa.